For decades, the enactment of motorcycle helmet laws have been a contentious issue pertaining to the rights of states versus the authority of the federal government and individual freedom versus government-mandated safety laws. As a result, motorcycle laws within the United States have undergone a significant number of changes over the past 5o years. While it is always advisable to wear a helmet when riding a motorcycle, it is important that you understand the particulars of the law in your state as well as those of states in which you might ride. In 1967, the federal government, in an effort to increase the use of helmets among motorcyclists, required states to enact mandatory helmet laws in order to qualify for millions of dollars in state highway funding. The incentive was largely successful in this aim––in 1974, all states except California and Illinois had laws requiring all riders to wear helmets. In the coming years, however, many state governments began repealing or amending these universal helmet laws, as many saw them as an infringement on personal freedoms by the federal government. In 1976, states were successfully able to lobby Congress to prevent the Department of Transportation from using using financial penalties to coerce states into enforcing helmet laws. Since then, the authority to enact (or not enact) helmet laws for bikers has remained in the hands of state governments. 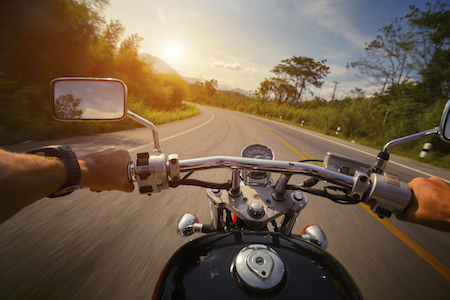 Today, motorcycle helmet laws vary from state to state. Currently, there are only 3 U.S. states that don’t enforce any type of helmet law for motorcyclists––Illinois, Iowa, and New Hampshire. Alaska, Arizona, Arkansas, Colorado, Connecticut, Delaware, Guam, Florida, Hawaii, Idaho, Indiana, Kansas, Kentucky, Maine, Michigan, Minnesota, Montana, New Mexico, North Dakota, Ohio, Oklahoma, Pennsylvania, Rhode Island, South Carolina, South Dakota, Texas, Utah, Wisconsin, and Wyoming all have partial laws requiring people riders to wear helmets while the states of Alabama, California, D.C., Georgia, Louisiana, Maryland, Massachusetts, Mississippi, Missouri, Nebraska, Nevada, New Jersey, New York, North Carolina, the Northern Mariana Islands, Oregon, Puerto Rico, Tennessee, Vermont, U.S. Virgin islands, Virginia, Washington, and West Virginia require all riders to wear helmets. Under Title 7 of the Texas Transportation Code, only motorcycle riders under the age of 21 are required to wear a safety helmet. Riders over the age of 21 are not required to wear a helmet with proof that they’ve successfully completed rider training or have medical insurance covering any injuries that may occur as a result of a motorcycle accident. After an accident, many insurers will look for ways to hold motorcycle riders at fault for their injuries in order to justify paying them less money. If you’re not wearing a helmet, insurance companies may try to lead you to believe that they don’t have to pay you anything for your injuries. For this reason, it is important that motorcycle riders involved in accidents in Texas cities like Houston hire a personal injury lawyer who is familiar with motorcycle accidents to help them recover financially and get back on their feet as quickly as possible. While the law may or may not require you to wear one, Josh Davis and the team of lawyers at Josh Davis Law always advise motorcycle riders to wear a helmet and stay safe on the road.